For fans of legendary pulp author H. P. Lovecraft, there is nothing bigger than the annual Providence-based convention the Summer Tentacular. Horror writer Colleen Danzig doesn’t know what to expect when she arrives, but is unsettled to find that among the hobnobbing between scholars and literary critics are a group of real freaks: book collectors looking for volumes bound in human skin, and true believers claiming the power to summon the Elder God Cthulhu, one of their idol’s most horrific fictional creations, before the weekend is out. Colleen’s trip spirals into a nightmare when her roommate for the weekend, an obnoxious novelist known as Panossian, turns up dead, his face neatly removed. What’s more unsettling is that, in the aftermath of the murder, there is little concern among the convention goers. The Summer Tentacular continues uninterrupted, except by a few bumbling police. Everyone at the convention is a possible suspect, but only Colleen seems to show any interest in solving the murder. So she delves deep into the darkness, where occult truths have been lurking since the beginning of time. A darkness where Panossian is waiting, spending a lot of time thinking about Colleen, narrating a new Lovecraftian tale that could very well spell her doom. That last—"the more repulsive, the better"—may well have been Mamatas' mantra whilst working on I Am Providence, because it is, if not a horrid novel, then a novel of horridness. Almost all of its characters are creeps, not least Colleen, who is so cavalier and careless in her pursuit of the truth that she points the finger at pretty much everyone she meets, such that it's no wonder she hasn't made a great many friends by the end. Not that anyone would want friends like these. Other than R. G. and maybe Ms. Phantasia's acolyte Chloe, the Tentacular's other attendees don't read like real people. Rather, they come across as embodiments of the most repellent elements of clique culture. In the way that they treat one another they're dismissive and demeaning; in the way that they treat outsiders—even the keen ones like Colleen—they're insular and indignant. No one is nice. No one is welcoming. No one is intelligent or generous or genuine. A single exception to show that not all con-goers are heinous human beings would have helped me to feel better about what Mamatas seems to be suggesting about speculative fiction fans specifically, but it wasn't to be, and sadly I Am Providence's narrative isn't any more balanced than its characters. Its pitch-perfect premise and early promise give way to a miserable, meandering thing that feels far longer than it is. Colleen's cockamamie theories about the crime she resolved to solve are "simultaneously complex and half-baked." (p.228) One follows another follows another and then there's The End. 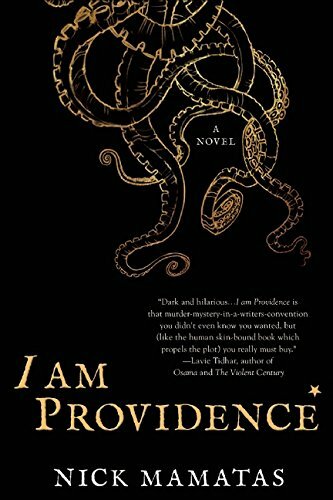 Clearly, there are some great ideas in here, but even if you can get past the flat characters and the circumnavigative narrative and the nastiness of the entire enterprise, I Am Providence goes nowhere of note, oh-so-slowly. The finest "Lovecraftian fiction posits a world that is indescribable, incomprehensible, and delicious," (p.153) a world that pairs pain with wonder, but there's nothing wonderful about this, and a dearth of deliciousness. I like your blog, but I think displaying reviews in full, instead of requiring one to click on them, would improve reader-friendliness. I suppose, apart from saving some space, this layout serves to give the reviews more attention instead of jumping right to the conclusion or looking for a "rating". I respect the intention, and please don't take it personally, but I think many roaming blogs and looking for a book that might interest them don't necessarily read reviews linearly, but look for interesting paragraphs that catch their attention, or even jump to the conclusion, and from there on read the rest of the review.